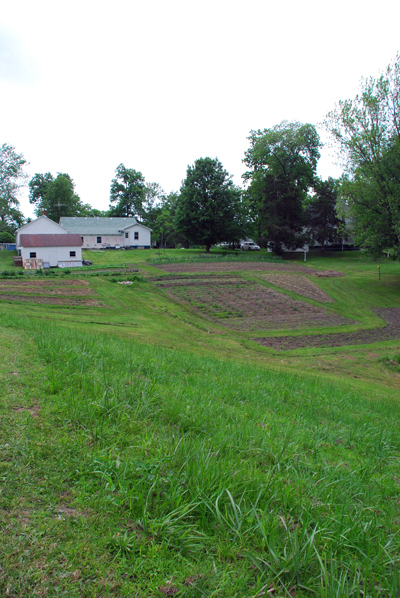 The experiences, trials, and lives on a small farm in rural Illinois. This post is here to stomp out the myth that asparagus must be started from crowns and even more importantly, stomp out the myth that asparagus takes three years to get a harvest. A little over a year ago I began searching the internet for an affordable way to start an asparagus patch... not only was I quickly discouraged by the high asparagus crown prices but also the fact that it would take 3+ years before I would ever see a return on my investment. What about seed? Finally, through various obscure and vague sources, I discovered yes, there are people who start asparagus from seed (although very few). I also found out then when properly done you can actually get full size spears and a full harvest in year two. This post is to let you know that it does work and to tell you exactly how I was able to do this. First you should know that crowns are grown from seed in a field. They are then dug up in the fall, stored, overpriced, and shipped to you, to plant. Yes, all asparagus is started from seed even the all male hybrids. 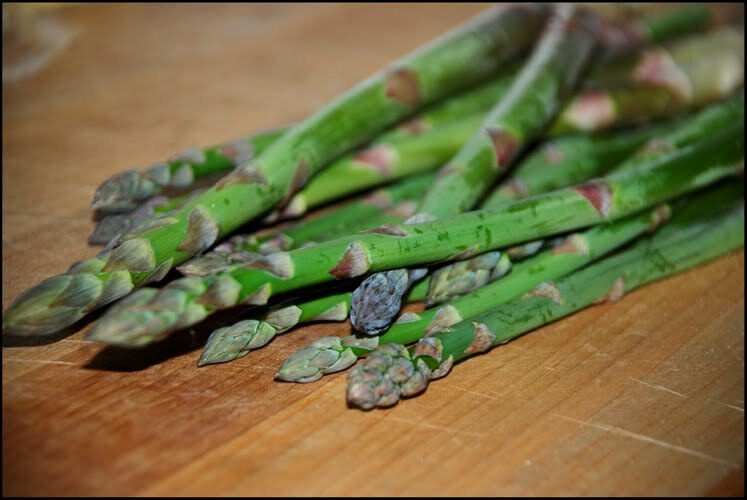 Asparagus is never propagated vegetatively for sale of crowns. It is a slow and inefficient process. come if this cold snap doesn't burn the tips... fingers crossed. So, how did I go from seed to spear in only 1 year? The whole process is quite simple. You must start the asparagus very early, I started mine the first week of February in 2010. I grew it out under lights until about the end of March. 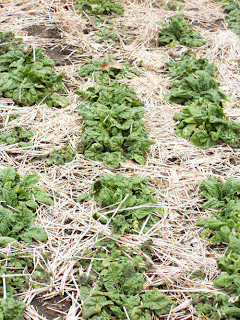 I then moved it to the cold frames where it sat dormant until late April. 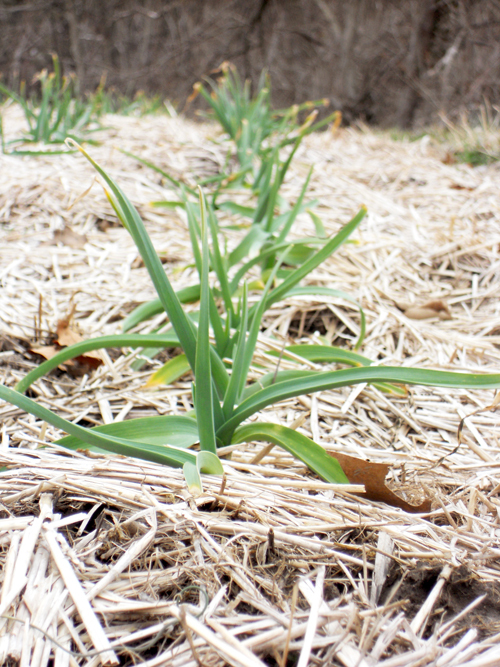 Toward the end of April I planted it out in a bed I had already prepared with about four inches of compost tilled in and all weeds destroyed. Starting early in the year does a very important thing, it lets the asparagus go through a vernalization period in the cold frames. Vernalization is a fancy way of saying the asparagus thinks it has already survived a winter, so technically the asparagus is two years old at only two and a half months. It is the exact same process I am going to attempt on artichokes this Spring to make them produce buds for me in Illinois. 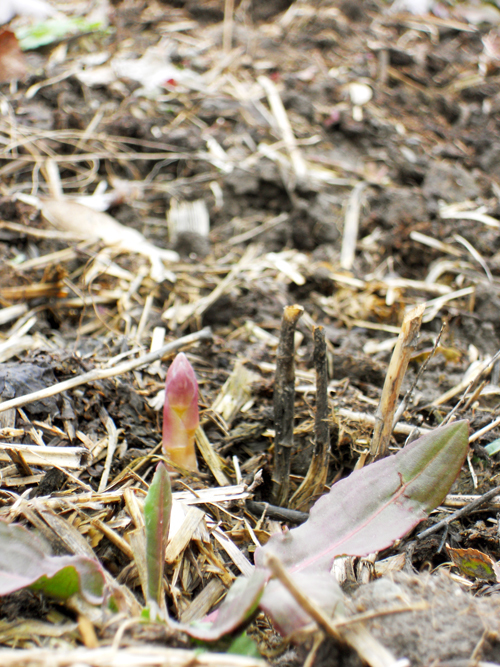 Once the asparagus was planted it quickly began to grow new growth as if it were two years old. Instead of 10-12 inch fronds at the end of summer mine were 3-4 feet tall. I also side dressed with more compost around the first week of June. I figured the side dressing might be beneficial during the last few weeks of growth. Asparagus crowns are currently selling for $1.50 - $3.00 a piece. I wound up with over 100 plants in my bed from a seed packet that cost around $3.00. peak turned opposite the house and barn. Anyone else ever find themselves pondering things like how to create a water pumping wind turbine, how to create on farm compost without animals, or how much syrup can I make from the handful of maple trees on my property? The book "Making Your Small Farm Profitable " has left me thinking, and for sometime now, "How much time do I waste walking". The author, Ron Macher, goes on to discuss the idea of how to make traveling on the farm more efficient. For instance, if you make the same 500 foot trip carrying water every day, that 500 feet amounts to traveling almost half a mile every week. Also consider that it takes at least ten minutes to walk a half mile, and with a bucket of water it probably takes much longer. So I pose the question; if you could move the water source, or even move whatever needs the water, would it be worth moving in order to make the trip shorter? The simple answer is yes. It is and certainly would be worth it, if it was possible and practical. Every time I need to till a garden I have to travel between 100 and 500 feet with a tiller that creeps along at two miles per hour, possibly slower. I have never timed one of my trips but I know each day their is plenty of wasted time. Recently I have begun to wonder if I should build a shed that is more centrally located or possibly get one of those kits/prefabbed sheds. If I had such a setup it would certainly make the trips shorter and would undoubtedly clear some much needed space in the garage. Now that I have realized my real need for such a wonderfully and conveniently located shed I do have to ask myself and decide which is more important, a new shed? or a tiller upgrade? Any suggestions? I love how the forecast is so variable. Checked yesterday and it was suppose to be sunny and warming up all week except a slim chance of rain on Wednesday. Now the forecast is saying rain for the next ten days except WEDNESDAY which is going to be sunny. At least the temperature is suppose to remain in the upper 50's and low 60's, of course that is subject to change. Going off the original forecast I got some planting done today so I wouldn't be set back by the rain on Wednesday. 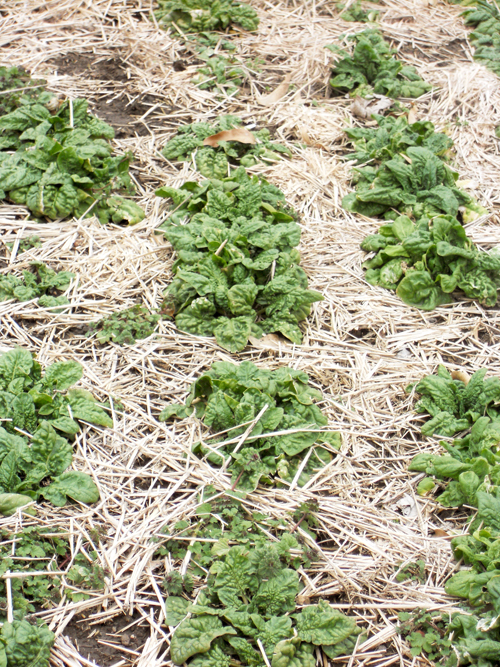 Spent the better part of the day planting the first round of potatoes, more radishes, more turnips, more lettuce, and more spinach. I am really hoping for this rain to hold off. I have a lot more seed potatoes coming and some spring planted garlic which all needs to get in the ground immediately. 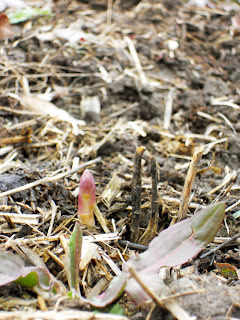 I also got a chance to inspect the overwintered crops (pictures) and spotted the first 2011 asparagus! I can't wait to harvest asparagus. All the over winted crops are looking very good. I have a few carrots heaved out from freezing but not many. For such a harsh winter I am very pleased. about a half inch in diameter. Next up for me is clearing a bunch of invasive trees that shade the south garden. A number of crops suffered last year in that garden from the shade. I also need to clear some brush for a partial shade spot I plan to plant some rhubarb on. I also have tons (literally) of compost to spread. So much to do and summer will be here in a blink.